GUILDERLAND – Charles E. Ebel, 95, of Guilderland, passed away Tuesday, November 25, 2014 at Albany Medical Center Hospital. Charles was born in Guilderland, and lived in Albany and Guilderland all his life. He attended Altamont High School, enlisted in the U.S. Navy in 1940, serving through the duration of World War II until discharged in 1946. He served aboard the USS Curtiss (AV-4) during the attack at Pearl Harbor. He later served aboard the USS Hornet (CV-12). He was employed for many years by GLF/Agway until his retirement. 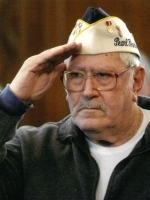 Charles was a member of the American Legion Post 977 Helderberg, American Legion Joseph E. Zaloga Post#1520, and the former Pearl Harbor Survivors Association. He played baseball for several leagues including Albany Twilight League. Charles was also an avid bowler and enjoyed many activities that included hunting, fishing, skiing, billiards and camping. Charles is survived by his beloved wife Barbara J. Nerf Ebel; his children Susanne Printy (Edward) of Cohoes, Jacqueline Kuehnert of Rome, Maureen Languish (William) of Selkirk, and Charles Ebel (Laura) of Colonie along with nine grandchildren, eleven great grandchildren, and his dog Lucky. He was predeceased by his parents Molly Coleman Ebel and Charles Ebel, an infant daughter, brothers Harry Ebel, Henry Zoll, and sister Marguerite Zoll. Funeral services will be held in the Hans Funeral Home, 1088 Western Ave., Albany, Saturday evening at 6pm. Relatives and friends are invited, and may call at the funeral home Saturday from 3-6 p.m. Inurnment will be in the Gerald B.H. Solomon Saratoga National Cemetery on Monday at 1:30pm. In lieu of flowers, the family suggests memorial contributions to the Mohawk Hudson Humane Society, 3 Oakland Ave., Menands, NY 12204. To leave a message of condolence for the family or obtain directions to the funeral home, please visit www.HansFuneralHome.com. The King family wants to extend its loving thoughts to the passing of Chuck, a fine teammate and long time friend,over the years, to teammates Jack,Tom and Chet King of the McKownville Arcadians baseball team. Chuck was certainly part of the Greatest Generation and we were the better for having known him, over his long life. MY deepest condolences, my father Edwin Sickler also in the Navy during WWII who passed away in 1991 played baseball with Mr. Ebel on a local team called the Arcadians located in McKownville. He also had many fond memories of those days. Again my deepest condolences Mr. Ebel is a true Hero of The Greatest Generation. I was so sadly surprised to hear of this news; Very sad! He was a Great, Great man with a great big heart! remembering him often at grandpas house watching the Mets and talking about him and chuck playing ball back then. I just can’t believe it! I was planning on stopping by next week to see him w/xmas card.